Our Gluten Free Muffins gift offers you two gourmet muffin varieties that are moist, rich and full of flavor. Cinnamony streusel muffins have an irresistible pecan and cinnamon topping. 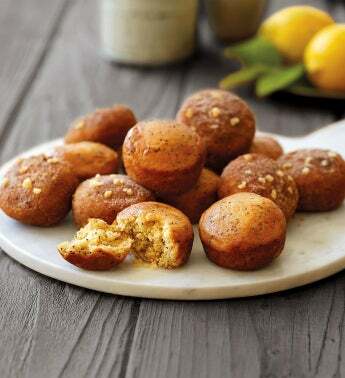 Made with zesty lemon and poppy seeds, lemonlicious muffins leave the gluten behind without taking the taste along with it. This gourmet food gift lets you enjoy a gluten and guilt free muffin, but begs you to question if these are for breakfast, snack time or dessert? There are plenty of muffins provided to nibble your way through the decision.